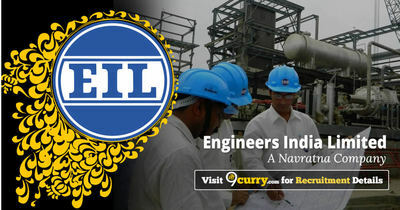 EIL Recruitment 2019: Engineers India Limited (EIL) / www.engineersindia.com is conducting recruitment processes to fill 1 vacancy. As of now, there is one recruitment drive going on for Apply Online/ Offline for Director (HR) Post. EIL Recruitment 2018 - Apply Online for 11 Officer, DM & SM Posts in EIL, New Delhi, Gurugram. Online Applications are invited by Engineers India Limited (EIL) from 25 Jul 2018 to 17 Aug 2018 11:59 PM for 11 vacancies. EIL Recruitment 2018 - Apply Online for Company Secretary Posts in EIL, New Delhi, Gurugram. Online Applications are invited by Engineers India Limited (EIL) from 07 Jul 2018 to 25 Jul 2018 11:59 PM for 2 vacancies. EIL Recruitment 2018 - Apply Online for 141 Engineer/ Officer, Dy Manager & Other Posts in EIL. Online Applications are invited by Engineers India Limited (EIL) from 30 May 2018 to 20 Jun 2018 til 11:59 PM for 141 vacancies. EIL Recruitment 2018 - Apply Online for 67 Management Trainee Posts Through GATE 2018 in EIL, New Delhi on Training. Online Applications are invited by Engineers India Limited (EIL) from 12 Apr 2018 to 02 May 2018 11:59 PM for 67 vacancies. EIL Manager, Sr. Engineer, JHT & Other Posts Recruitment 2017 - Job notification for 16 Manager, Sr. Engineer, JHT, Sr. Officer, & Hindi Typist Posts in Across India. Online Applications are invited by Engineers India Limited (EIL) from 28 Nov 2017 to 18 Dec 2017 till 23:59 hrs for 16 vacancies. EIL F&A Officer & Draftsman Recruitment 2017 - Job notification for Engineer, F&A Officer, Environmental Engineering (Engineer ) & Draftsman Posts for Persons With Disabilities. Online Applications are invited by Engineers India Limited (EIL) on or before 15 Dec 2017 for 5 vacancies. EIL Apprentice Recruitment 2017 - A Job notification is issued for recruitment on 229 Trade Apprentice & Technician Apprentice Posts on training basis. Applications are invited by Engineers India Limited (EIL) on or before 28 Nov 2017 for 229 vacancies.